Sophie never challenged her arranged marriage. Until one secret night with Renzo leaves her pregnant! Renzo will legitimize his child—even if it means stealing Sophie from her own wedding to make her his bride! Cristiano is furious that Hallie hid the consequences of their hot night, and demands she marry him! Their passion is still powerful…but Hallie wants a real family. Will seduction be enough to secure Cristiano’s legacy? Certain that Regan has information on his sister’s disappearance, Sheikh Jaeger steals her away to his palace. 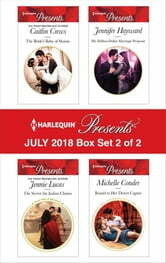 But when beautiful, defiant Regan accidentally causes a media storm, to resolve it Jaeger must marry her! 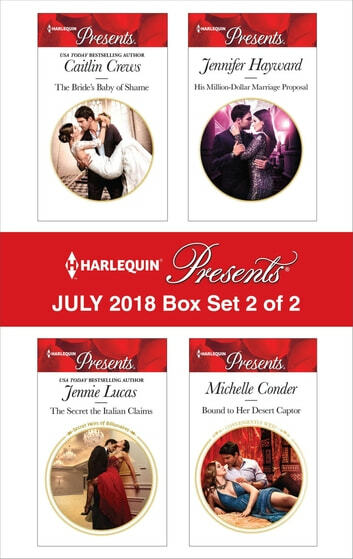 Be sure to collect Harlequin® Presents’ July 2018 Box Set 1 of 2!